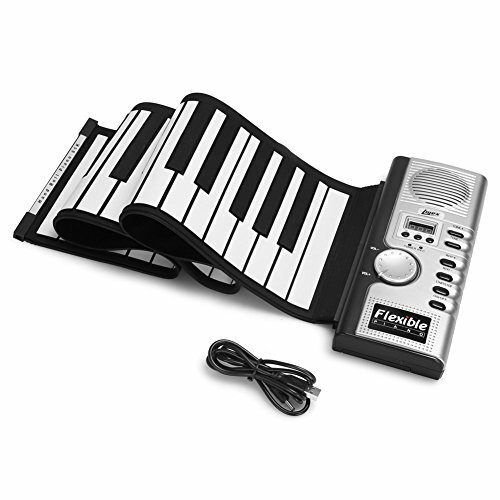 Roll Up Piano Keyboards are a great compact and hassle-free way to play. These are low cost and require a very small amount of space. They are great for both adults and kids alike that would like to learn to play but haven’t yet invested in a full keyboard. These are also great for those on the go. Learning to play the piano requires a lot of practice, so you could pop one of these in a case and practice while you are traveling. Are Roll Up Pianos as good as the real thing? Well, not exactly, but they can serve as a good starting point or secondary option while traveling. Some of these come in as much as 88 keys, a full sized keyboard. Others come with 61 keys, which are common sizes for keyboards. 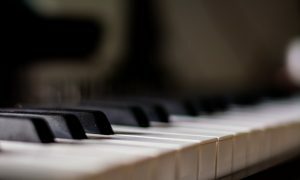 If you’re serious about learning the piano, try to get one with more keys. However, also keep your space constraints into account. 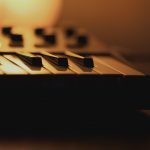 Towards the end of this article, we have also recommended some good learning resources for beginner keyboard players. These would be a great accompaniment to your first roll up piano. Equipped with 128 tones and more than 100 rhythms, the Lujex Foldable 61 Keys roll up piano is a fine value for money. It’s easily carried and stored, which makes this roll up piano a practical option for travel. Of course, you or your kids can play it in the comfort of your home. What adds to the convenience of this instrument is the input for headphones so that you can practice this Lujex Foldable instrument in peace. The integrated stereo speakers give you a chance to play your tones out loud, as well. The modern MIDI technology built into this instrument enables you to connect it with your computer so you can edit your music or add new rhythms to the existing ones. 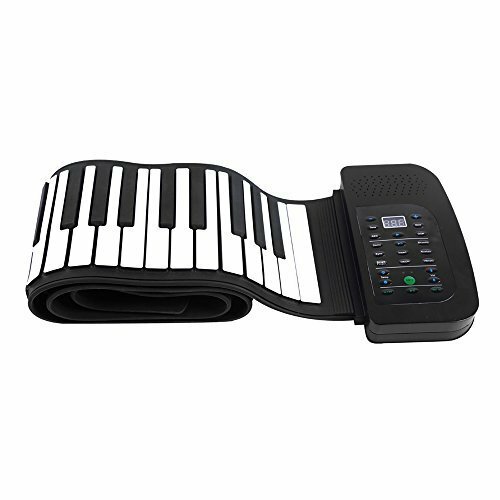 Smooth design, with a comfortable feel for fingertips and the silicone keyboard is another reason why this roll up piano is a smart choice for every piano enthusiast. Still, it’s good to know that you can play only three keys at a time, meaning that it’s not possible to play complex chords on this instrument. That’s why it’s the best option either for kids or adult beginners. A standard roll up piano with 128 different rhythms and 140 tones, the KMUSIC Roll Up Piano is a comfortable and practical instrument. It comes with 61 keys, which is a standard keyboard for this price and product range. There are control keys for volume and speed, and you can also adjust the tone and rhythm on this keyboard. The LED digital display makes the user experience smooth and fast. You can easily choose the controls that you might need at any particular moment of your practice. As for the ease of use, the KMUSIC Roll Up piano comes is a light and easily installed instrument. It can be smoothly stored and carried wherever you go. The rechargeable battery makes it an ecologically efficient instrument. The pedal that comes with this roll up keyboard will help you change the modes as you play, without interrupting the practice. You can plug your headphones or additional speakers into this KMUSIC foldable keyboard. 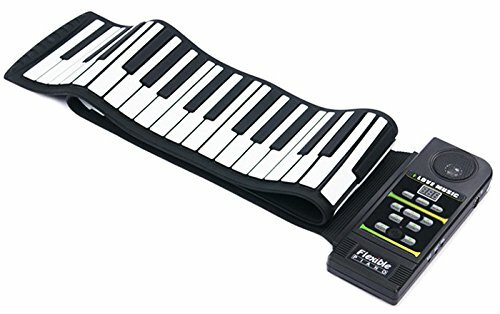 The Flexion Portable Roll Up Piano is a reasonable option for a piano player who has already mastered the basics of this instrument. It comes with 88 keys, 128 tones, and 128 different rhythms. Apart from that, it also has MIDI interface and integrated speakers. Logically, there’s also an input for headphones or additional, external speakers. That way, you can play to yourself, but you can also give more loudness and volume to your piano practice. 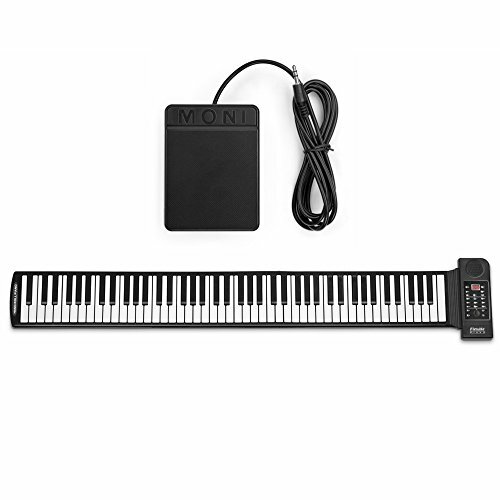 You can also connect MP3 or MIDI additions, as well as amplifiers to this portable keyboard. As for the design, this Flexion is a visually attractive instrument with a keyboard that looks like a piano. Since it’s can be folded easily and quickly, it’s more than convenient for holidays or other long periods of time when someone doesn’t have access to their real piano. In the case you want to expand your playing knowledge with some editing skills, this keyboard is compatible with Mac OSX and all the versions of Windows from Windows 7 onward. 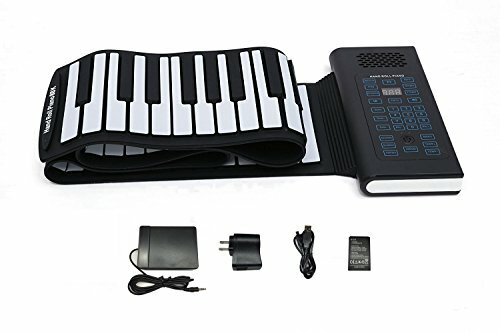 A simple and practical roll up keyboard, the Andoer Portable Roll Up Keyboard with 88 keys is a smart choice for every piano beginner. It comes with as many as 128 different rhythms and 140 tones, as well as 30 integrated demo songs. This variety of options will be interesting for a music beginner to start their musical research and practice. As for the practice, you can rely on the default, built-in speakers, plug in your headphones, or attach external speakers to this Andoer keyboard. What’s more, you can also use a MIDI controller to edit your files. 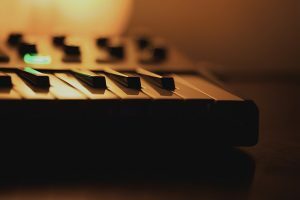 This is will come in handy for people who don’t only want to practice music but also to delve deeper into its production. The digital display makes all these functions easily reachable and visible at every single moment of your practice. Finally, the silicone keys add to the ergonomics and ease of use when it comes to this roll up keyboard. With 88 keys, like just a full-scale, real piano, the Tomsenn roll up keyboard is a fine option for a newbie to the world of piano. 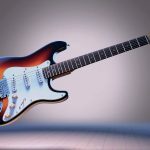 The combo of 23 demo songs, 100 rhythms and 128 different tones provides an ample number of different elements that should meet your musical demands. This roll up keyboard can be connected with a computer and supports the MIDI connection so that you can play with the basics of music production. A great add-on in this keyboard package is the pedal, which will make the practice much more convenient. It might take some time, in the beginning, to get accustomed to the use of this pedal, but it will serve as a great addition for smoother practice. As for other pieces of equipment, you can connect a pair of headphones or external speakers to this Tomsenn keyboard. This instrument comes with a digital display that will always inform you about the current modes you’re using. Now let’s talk about some great learning resources that you can get your hands on, which will help to get you started. Written by professor Damon Ferrante, this resourceful and well-organized book will help you learn how to play the piano from scratch. Given that most adult beginners find reading notes difficult, this guide offers such learning methodology that doesn’t demand music reading. The accent is on creativity, simple techniques, and the joy of playing music. There are also video lessons, as an addition to the chapters of the book. From The Entertainer to Jingle Bells to Amazing Grace and Für Elise, you’ll learn a vast array of popular tunes. Written by Willam A. Palmer, Amanda Vick Lethco, and Morton Manus, this is one of the most popular piano learning books for kids in the last fifteen years. It starts by explaining the keyboard and the keys, with special tips on how to memorize the names of the black and white keys. Then it moves on to simple rhythms, only to switch to the bass and treble clef. Later, your kid will learn the intervals of different notes (2nds, 3rds, 4ths, etc), as well as the sharp and flat sign. The songs in this books cover kids’ tunes, so as to keep them motivated to continue their practice. There are a wealth of great video tutorials online, particularly some great free Youtube channels, such as the one by Andrew Furmanczyk. Check out the first lesson below. The website pianolessons.com is also a great place to get started. After a while, you might decide to keep going and invest in a full keyboard or piano! Roll up keyboards are fun and convenient options to get you started and practice your playing. If you’re learning how to play for the first time, it would be useful to get a book that will help you make those initial steps on your musical instrument journey. They are also great options for parents that want to check if their kids are interested before investing in a more fully-fledged option. So that’s our article on roll up piano keyboards. Happy shopping!